Ever since I picked up my motorcycle and starting conversing with other riders, both in the area and around the country, I have been asked if I had been to Akiyoshidai yet. 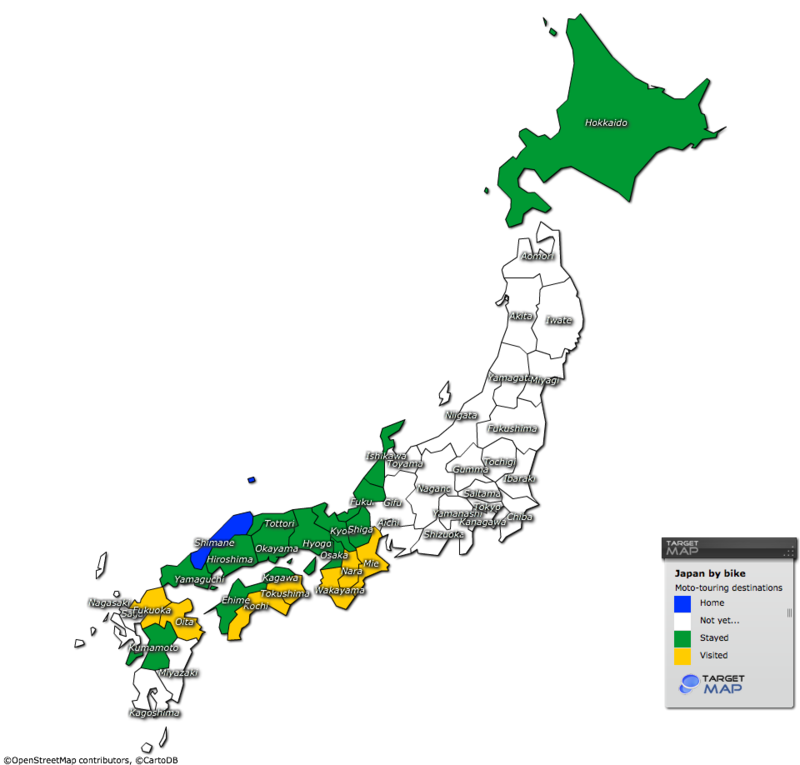 It seems that it is a bit of a requirement for anyone within a 500 km radius, or even wider if you are an ironbutt rider. So, as it is only 124 km from home, it was to Akiyoshidai that my son and I planned our first motorcycle camping trip together. 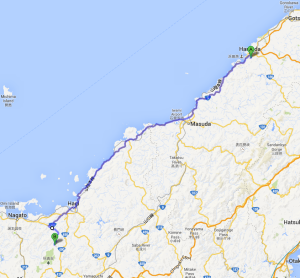 The planned route was dead simple: take route 9 to Masuda, route 191 through Hagi, and then route 28 to the campsite. This would bring us down along the coast of the Japan Sea for most of the ride, affording some rather beautiful views along the way. Google maps claimed we could make the trip in about 2.5 hours, so I had hoped to get on the road by 9:00 to allow for a lunchtime arrival in Akiyoshidai. As to be expected on one’s first camp trip involving more than one person, one of whom being a late-sleeping tweenager, we got a bit of a late start of it. The start was made a bit more awkward as the curious housewives from the surrounding apartments circled around me as I started the packing process before 9, so we had the added pressure to get moving so that they could all get back to their kids and morning coffee. Complaints aside, it is always nice to have people lining the dock as you pull out on a voyage, so it was nice to have them all there. Our late start down the coast on route 9 meant that we were in a bit of traffic to begin with, but it mostly opened up as we exited Hamada and left the stop light zone behind us. It was a beautiful day, and the blue skies and calm sea to our ride made for a pleasant ride. Taiga and I took turns pointing things out to each other over our bluetooth headsets, and basically enjoyed those strange conversations that happen when two people are trapped together. We made our first stop to stretch our legs and take some photos as we arrived in Abu, just northeast of Hagi. Abu has some beautiful views, as there are a number of islands just off the coast. We took the opportunity to have some fun with my iPhone’s panorama option. Did you know that Taiga had a twin? 😉 After Abu, we took one more quick stop at the marina in Hagi to grab a snack, hydrate, and take some photos. Hagi is a nice area to drive/ride through if you ever have the chance. From Hagi it was a short hop down the remainder of 191 to route 28 before we reached our campsite; the Akiyoshidai Refresh Park. We arrived at around 13:00, only to find out that the front desk for the campsite does not open until 15:00, so it we decided to keep riding and take the scenic route through the Akiyoshidai kart plateau. The road only takes about 20 minutes from beginning to end, but the views are spectacular. We stopped at a few spots to take photos, but we simply could not capture all the beautiful views. They were simply too numerous. Once we arrived at the official viewing spot, we took a break to play with a miniature schnauzer that some other visitors had brought along. We chatted with them for a while, and in a very Japanese gesture the wife offered us some small candies as they offered up their seats and walked away. Taiga and I stretched out right there and took a short nap to recoup after the long morning on the bike. Having recovered a bit, we hopped back on the Akiyoshidai road and pointed ourselves back towards the campsite. We checked in without incident and set about putting our tent up. There is something to be said about the simple interactions had when two people put themselves to the task of setting up a campsite. This was truly one of the best parts of this trip with my son; the simple, and often obscure/strange conversations we had while either working around the campsite or riding on the bike. It is these conversations that make a trip like this. The roads, the views, the different locations are all beautiful in the moment, but it is the bonds forged in the simple conversations that have the most lasting effects. We had checked in behind three other motorcycles with Shimane number plates, and we set ourselves up far enough down the line so as not to bother (or be bothered by) them later in the evening. This turned out to be an unnecessary precaution, as Taiga ended up making fast friends with them as we met them along the path to the camp’s onsen (hot spring). We joined them in the rotenburo (outdoor bath) and joked and laughed a while. I joined them for a vending machine beer in the onsen lounge, and then we ended up spending the night around their campfire sharing food, drink, and good conversation. Overall, it was a great ending to a fantastic day.